TUCSON, Ariz. (AP) Arizona has the type of roster that could end coach Sean Miller’s Final Four-less tenure in the desert, possibly win a national title. The Wildcats are deep, talented, with a nice mix of veteran players and five-star freshmen. The arrest of an assistant coach as part of a federal recruiting probe casts a dark shadow over the program and raises numerous questions that could follow the Wildcats the entire season. How many players on the current roster will remain eligible? Will the probe into bribes and kickbacks, which led to the arrest of Wildcats assistant Emanuel Richardson, reach all the way up to Miller? Will the NCAA impose sanctions based upon what the FBI has found and might still find? Miller’s program came under scrutiny after Richardson was among 10 people arrested on Sept. 26 as part of a federal investigation into alleged bribery of recruits. 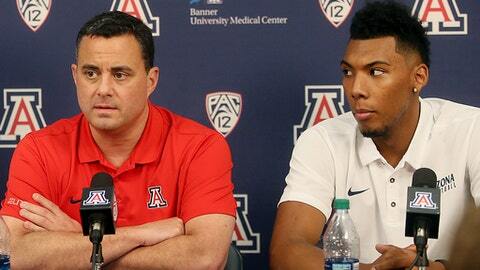 Richardson was accused of accepting $20,000 in bribes and using that money to entice a recruit to attend Arizona. The probe is still ongoing and may not be resolved before the season is over, leaving the Wildcats no choice but to play on without knowing what the future will hold. On the court, the Wildcats are in great shape. Arizona won 32 games and reached the Elite Eight last season, leaving Miller just short of the Final Four yet again. He could get there this season. Arizona has a solid core of returning upperclassmen, including potential All-American Allonzo Trier, big man Dusan Ristic, point guard Parker Jackson-Cartwright and dynamic guard Rawle Alkins, who will be out until December after breaking his foot in an offseason workout. Add to that another stellar recruiting class, headlined by athletic big man Deandre Ayton, potentially the best recruit Miller has ever had. ”I think we have the makings of something special,” Miller said. TRIER RETURNS: Arizona got a huge boost when Trier decided to return for his junior season. The 6-foot-5 guard is one of the nation’s best scorers and a go-to player with the game on the line. Trier led Arizona at 17.2 points while shooting 46 percent and averaged 5.3 rebounds per game. He’s developed into a strong leader and could be the player to take Arizona deep into the NCAA bracket. RISTIC’S RISE: Ristic has drawn Miller’s ire in the past for not playing defense the way he wants, but the Serbian 7-footer has made strides in that area. Ristic had a developed offensive game the moment he stepped on campus as a freshman and can score in the lane with either hand. He averaged 10.9 points and 5.5 rebounds a year ago, numbers that could go up this season. AYTON ARRIVES: Miller has brought in some of the nation’s top recruits during his tenure in the desert and Ayton could end up being the best of the bunch. At 7-1, 260 pounds, he already has the build of an NBA player and is almost freakishly athletic, jumping high enough to touch the top of the backboard. Ayton has the makings to be one of the best players, not just freshmen, in the country. THE FACILITATOR: Jackson-Cartwright is often the smallest player on the court at 5-11, 170 pounds, but is one of the nation’s most efficient point guards. Last season, he was 12th nationally with an assist to turnover ratio of 3.1 to 1 while averaging 4.1 assists per game. The pass-first point guard could be the perfect facilitator for Arizona’s cache of scorers.